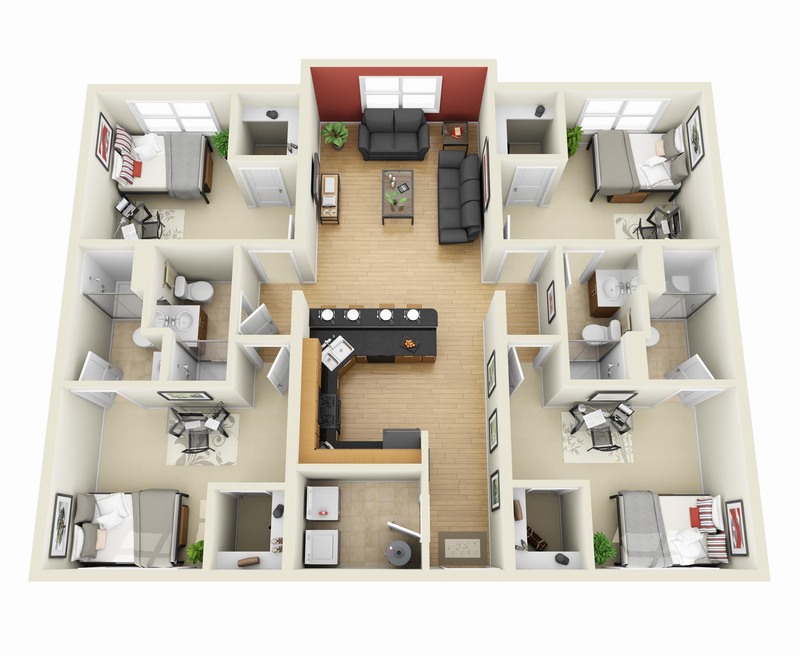 After having covered 50 floor plans each of studios, 1 bedroom, 2 bedroom and 3 bedroom apartments, we move on to bigger options. 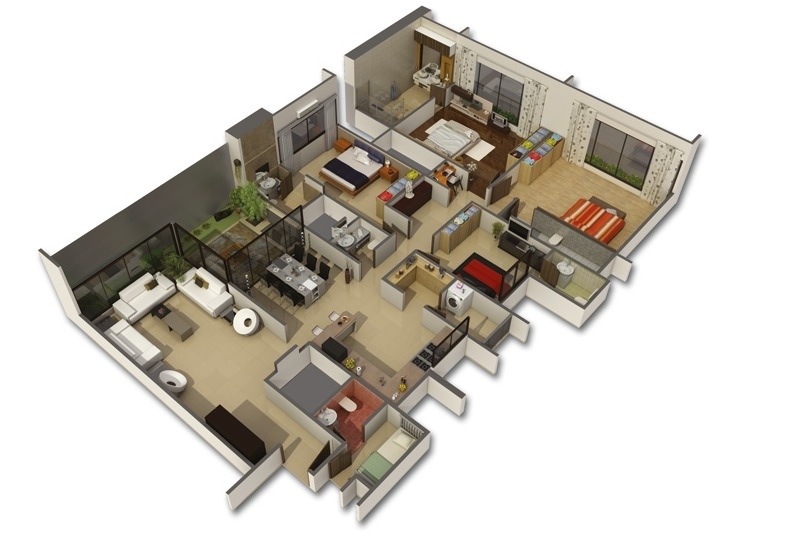 A four bedroom apartment or house can provide ample space for the average family. With plenty of square footage to include master bedrooms, formal dining rooms, and outdoor spaces, it may even be the ideal size. 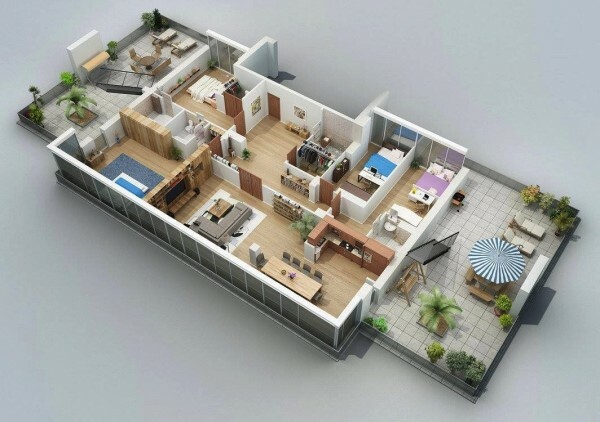 The home plans included in this article give us plenty of wonderful ideas as to how to best arrange and even decorate this type of home. 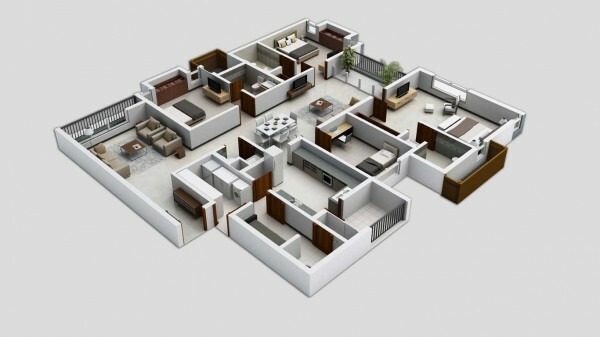 The visualizations here range from the modern and chic to the suburban and cozy. 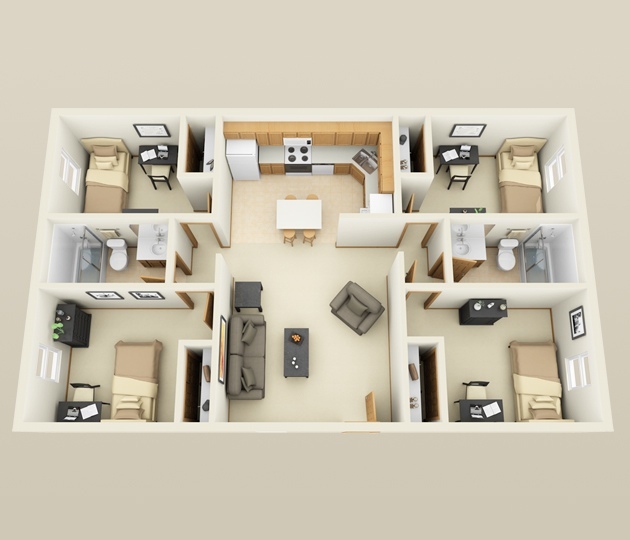 Keep reading to get more ideas for your home or apartment space. 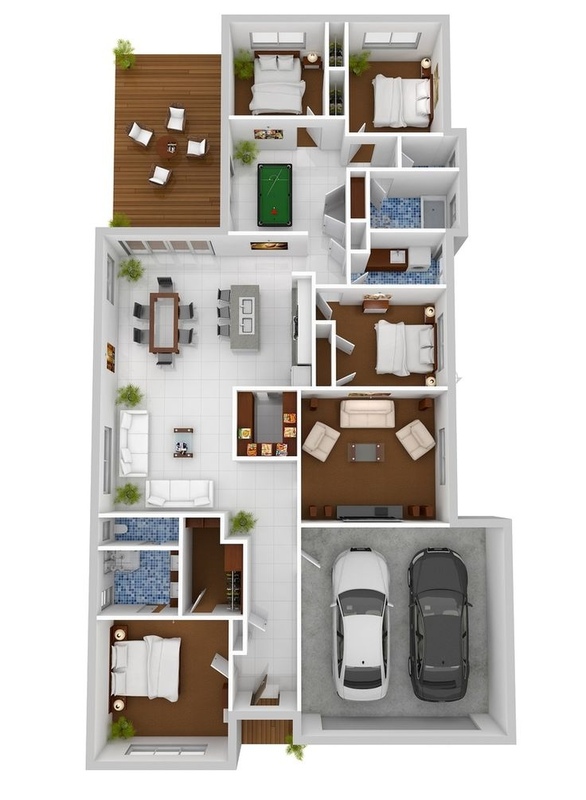 This urban home from Estado Properties has plenty of gorgeous details to love including an interesting variety of flooring options, a huge gourmet kitchen and a cozy private patio. 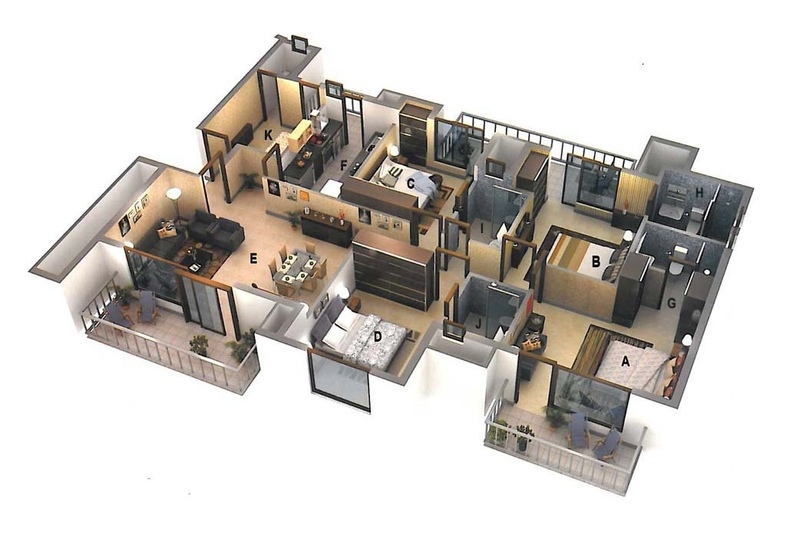 This home plan from Privie World includes a formal dining room that seats 10 as well as en suite baths and a spacious deck area. 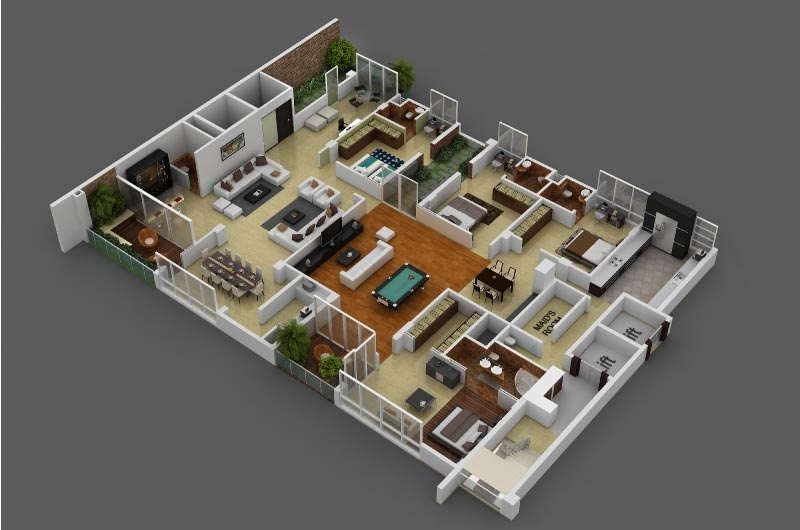 Making use of a spacious living area, this four bedroom layout, also from Privie World, turns one living room into two by tucking a sectional into one corner and creating a cozy, Asian-inspired conversation nook in the other. 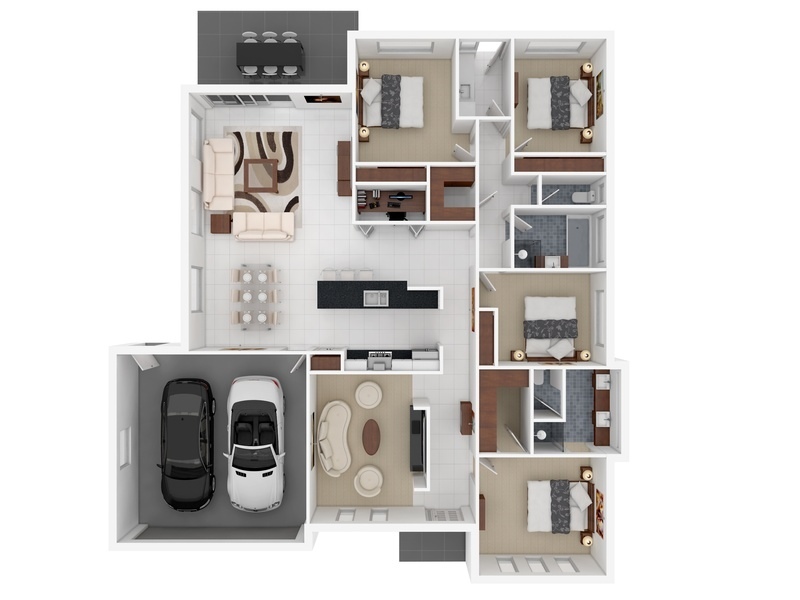 In this four bedroom flat, Visualizer Razvan Leontescu shows us that limited square footage doesn’t have to mean compromise. 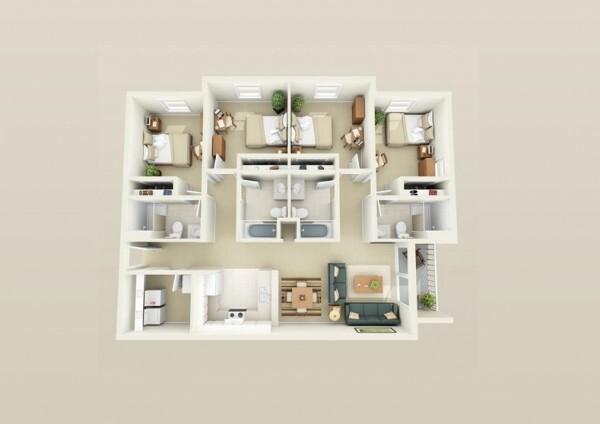 The layout still includes four bedrooms, a private balcony, a dining area and even a breakfast nook. 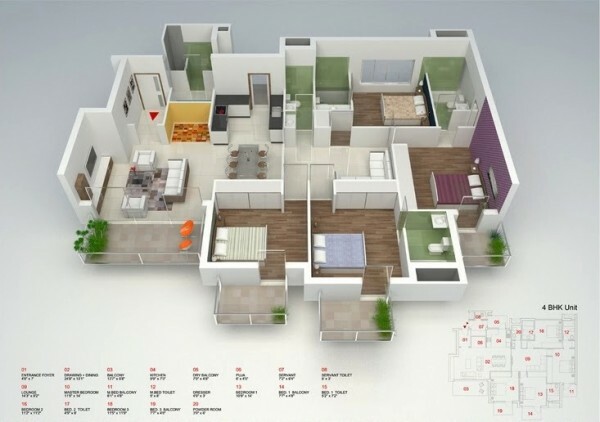 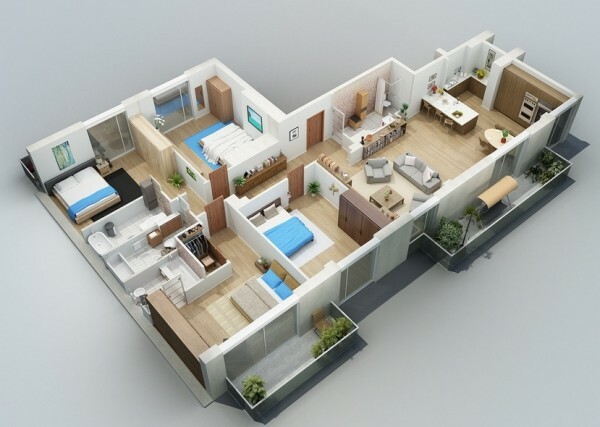 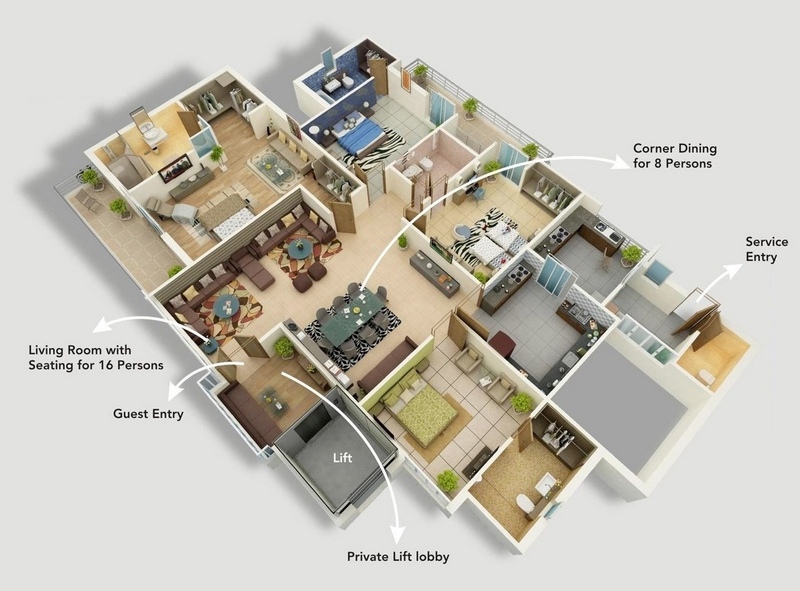 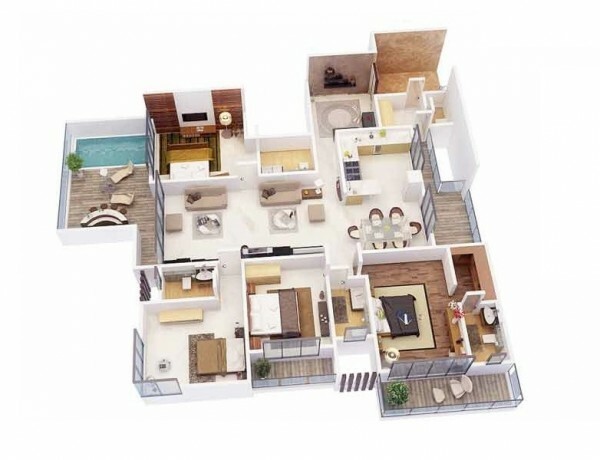 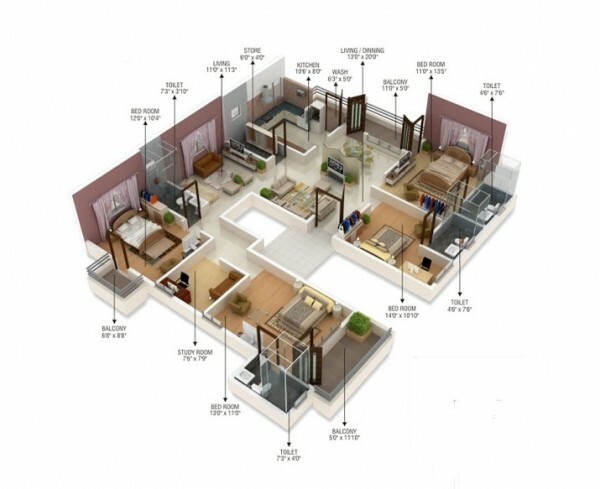 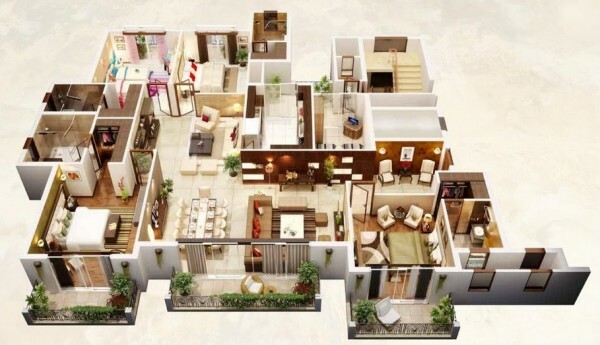 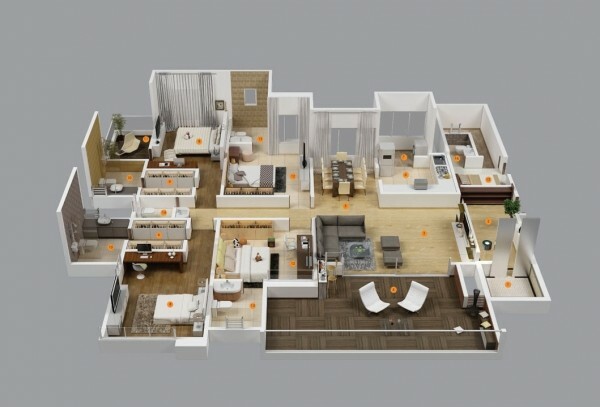 This home plan from DNA Realtors makes good use of every square inch, managing to include three separate balconies along with three large bedrooms and a smaller guest bedroom. This sleek flat takes every opportunity to simplify from platform beds to low tables. 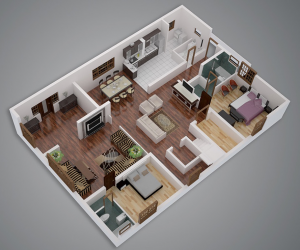 The basic color choices, largely whites and grays, make it much easier to get a sense of the actual space and room available. 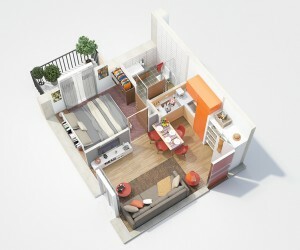 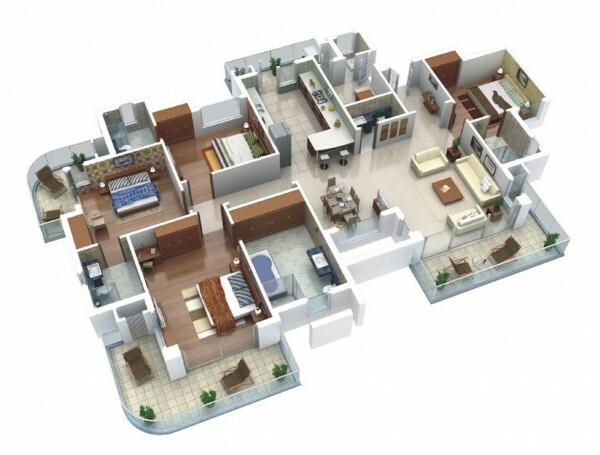 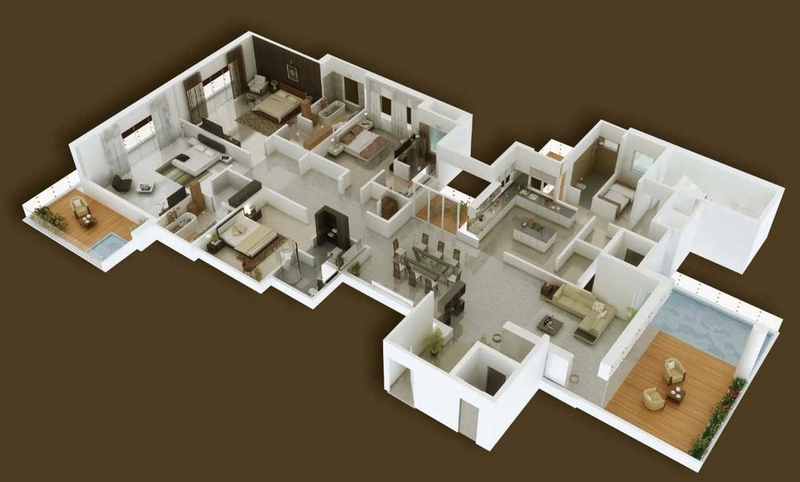 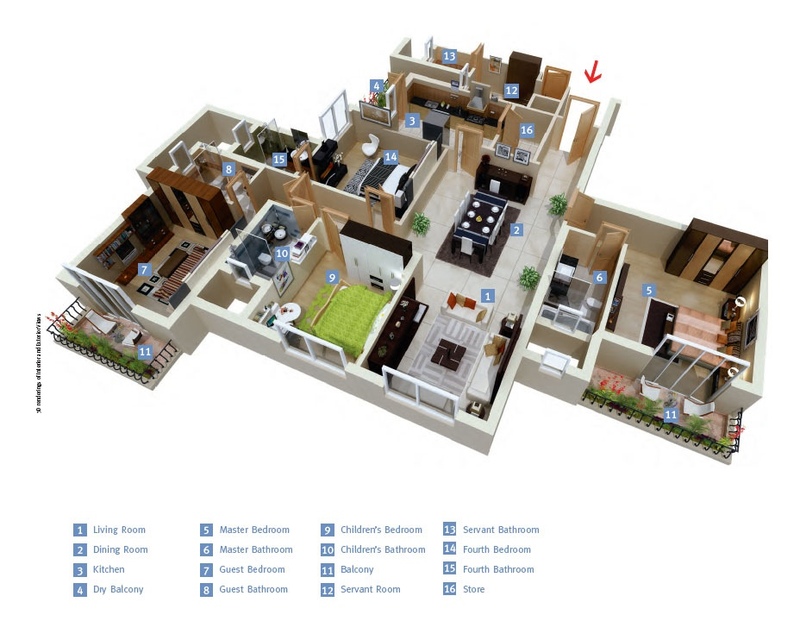 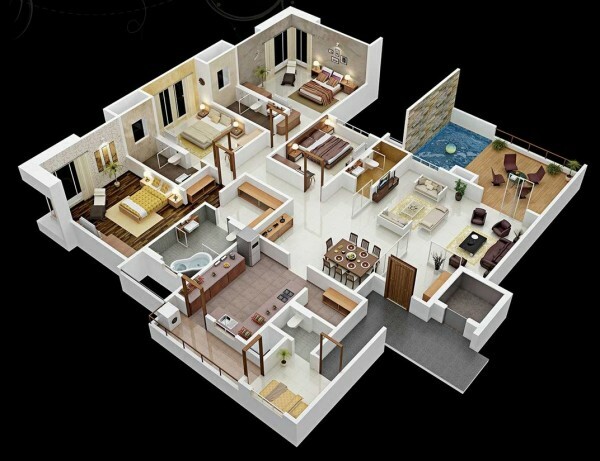 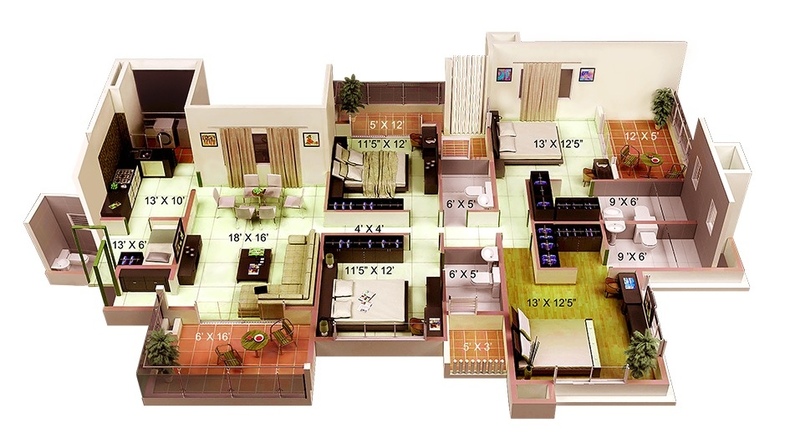 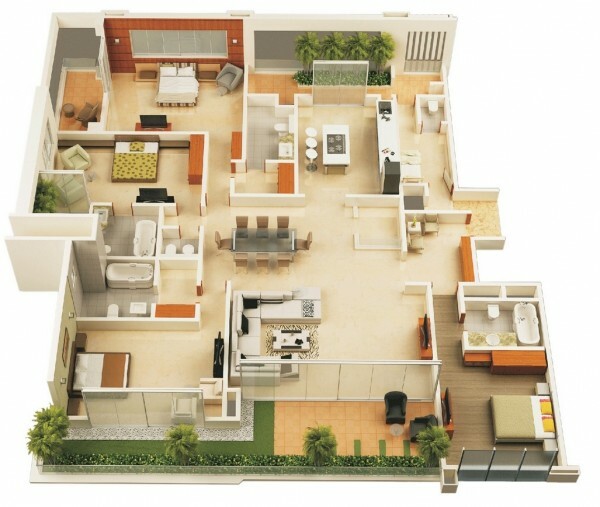 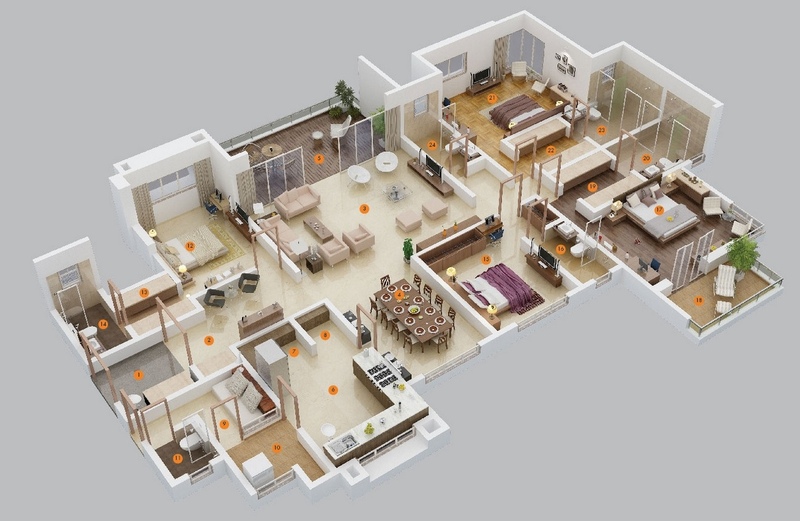 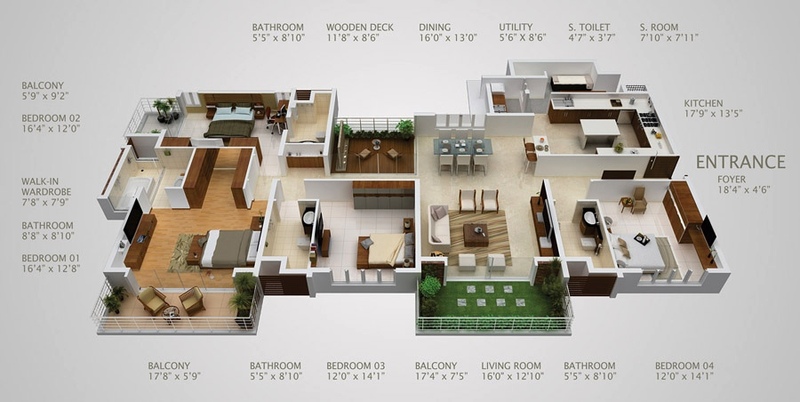 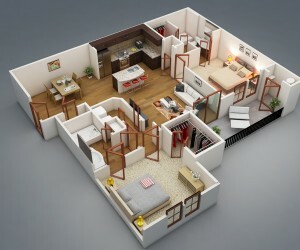 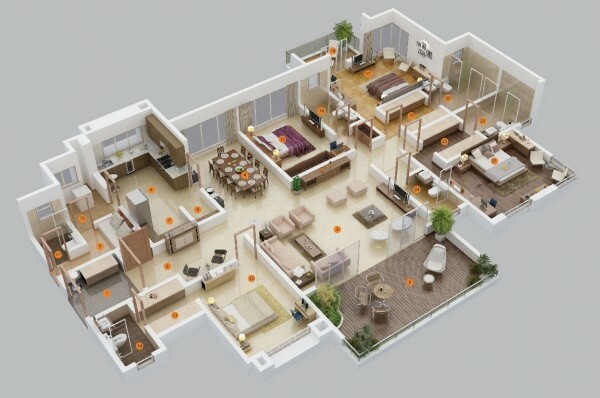 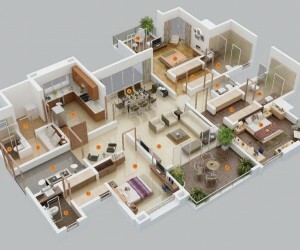 This four bedroom layout from Media Contact gives each occupant a good deal of privacy. 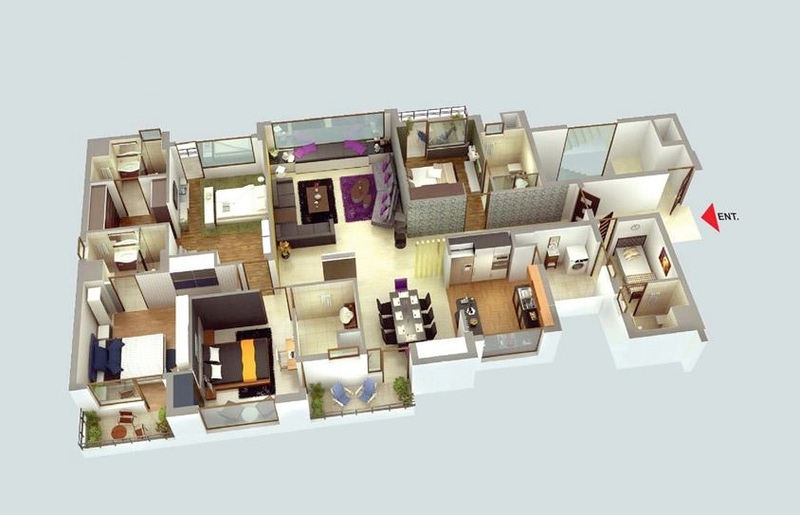 Three of the rooms even include a private outdoor space with separate entrance. 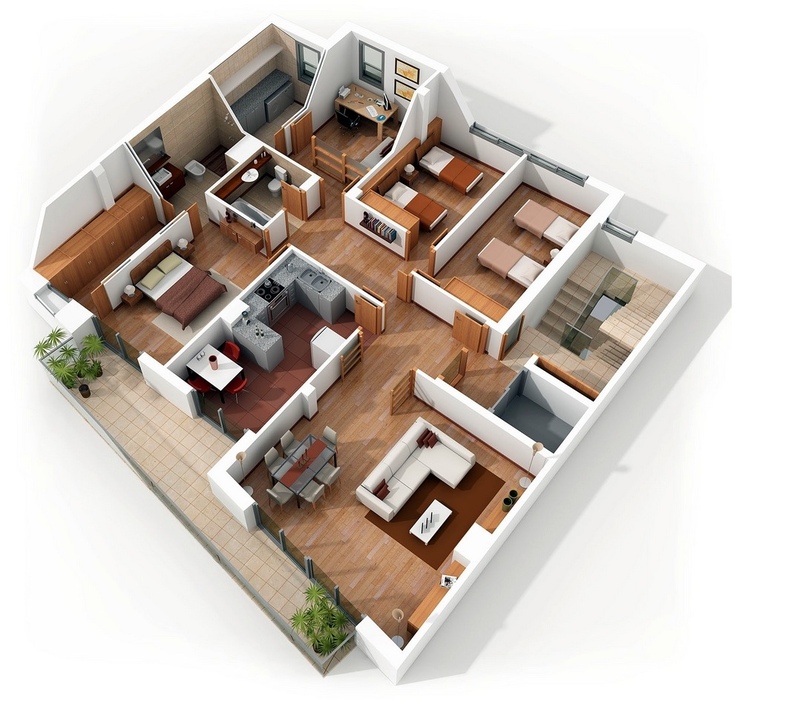 When it comes to four bedroom floorplans, including uses for outdoor space is essential. This one-story layout has a grassy patio in addition to wooden decks and balconies, which really add to the overall luxury of the home. 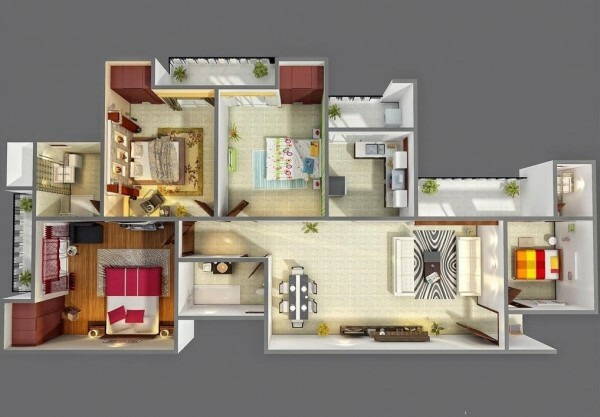 Plenty of windows and reflective surfaces give this four-bedroom apartment a much bigger feel. 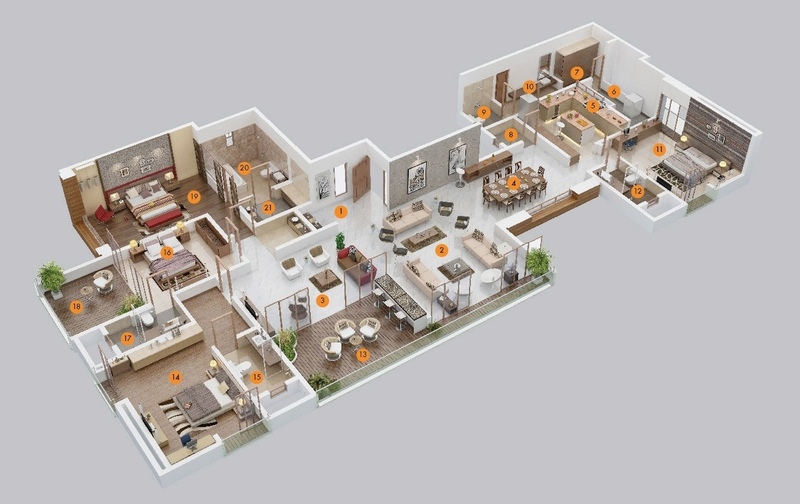 It is easy to see where the passions of this home’s potential occupants would need to lie. 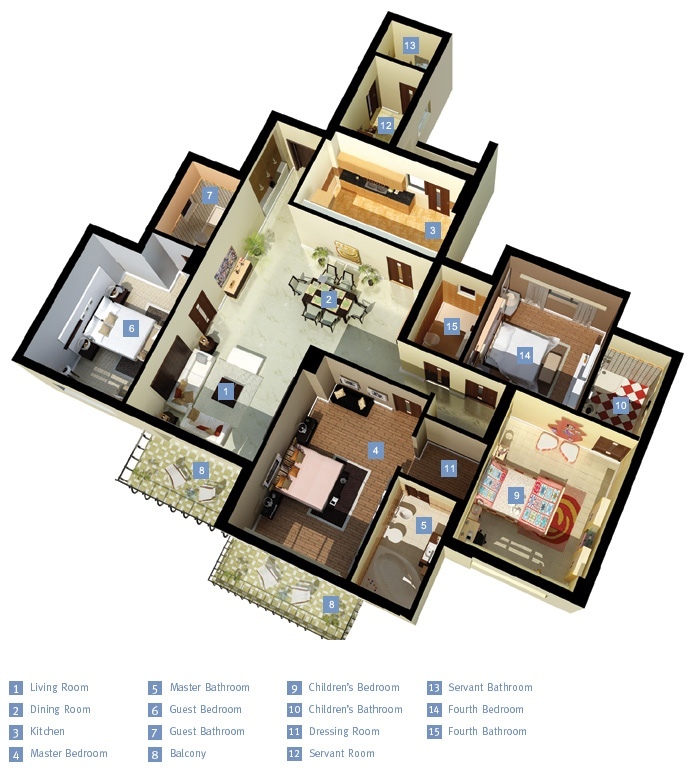 Each bedroom is barely large enough for a bed but there is plenty of room for billiards and dining. 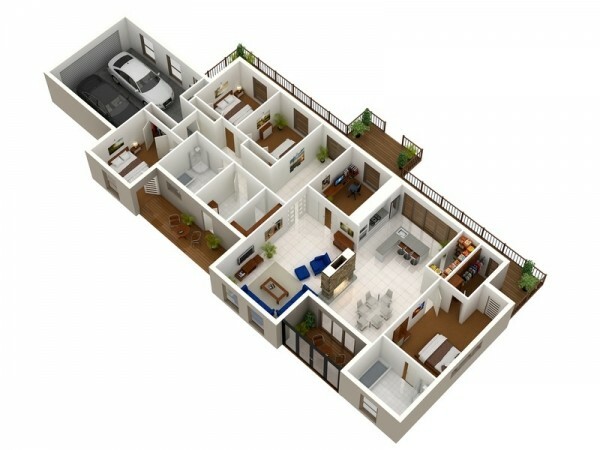 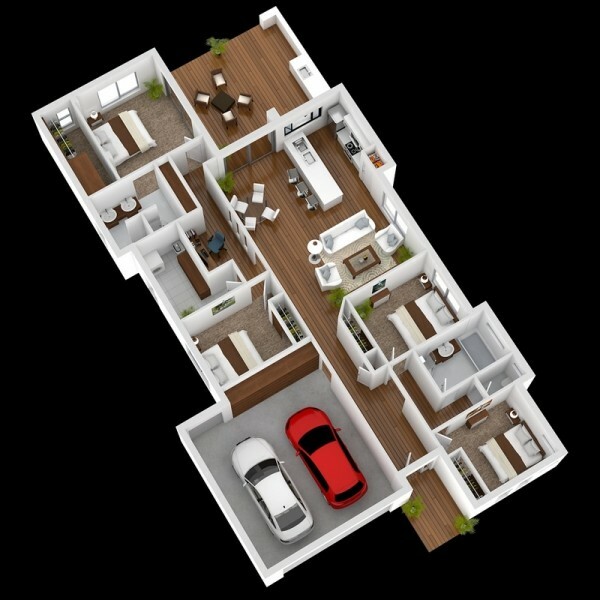 This four bedroom house manages to make room four two cars, four bedrooms, and separate study. An amazing use of space. 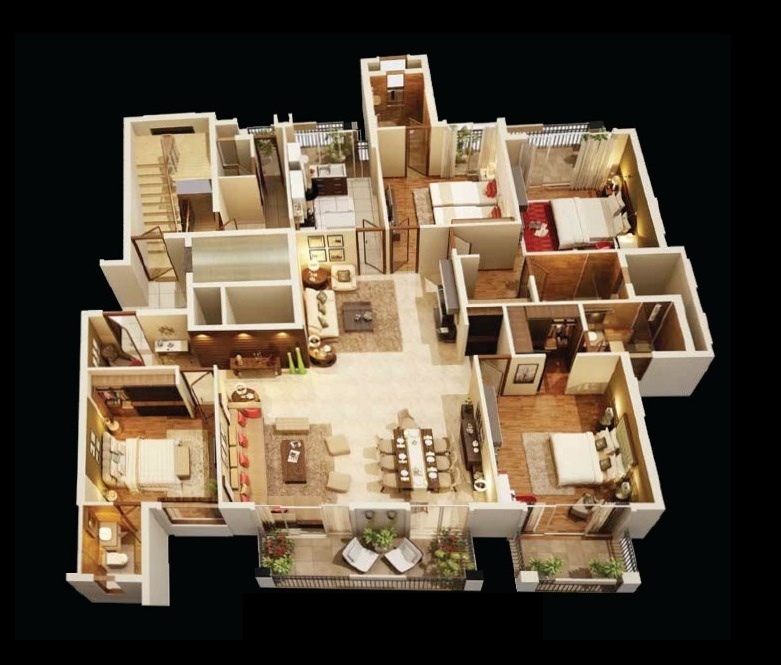 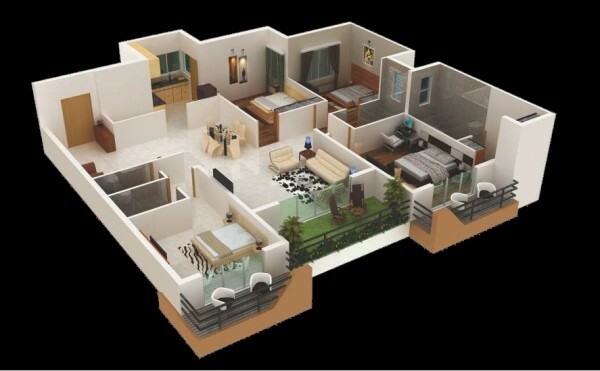 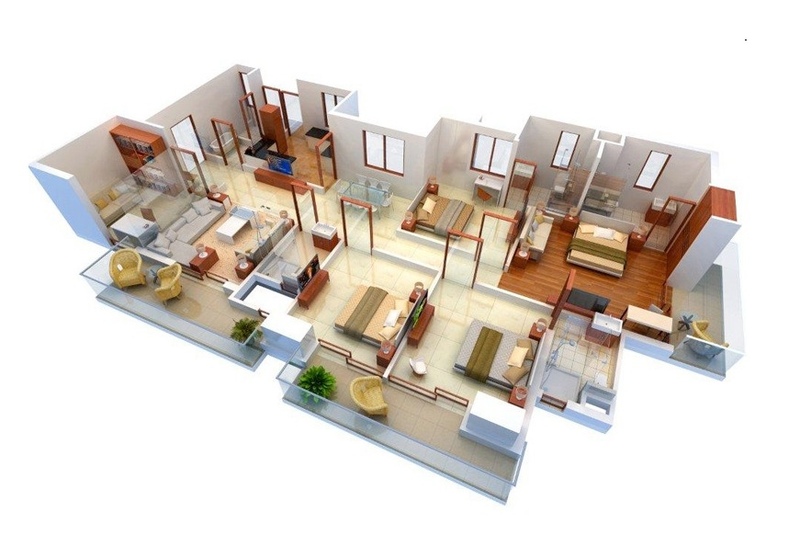 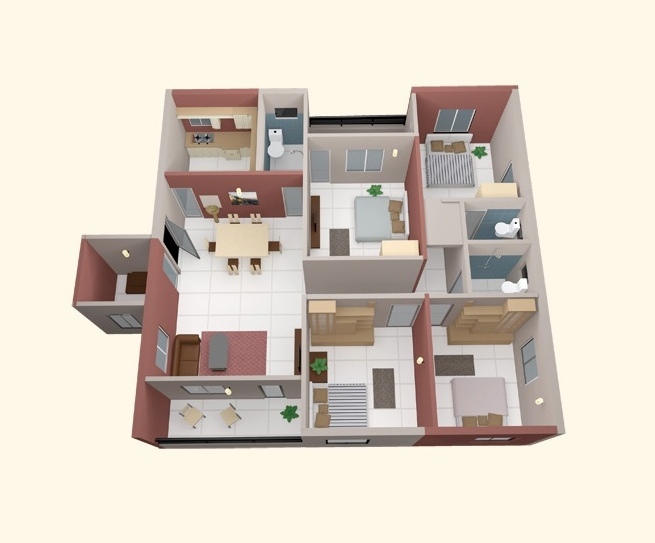 This luxury four bedroom from Ansal Housing includes four regular bedroom and a servant’s quarters. 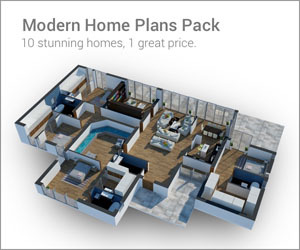 Fancy that. 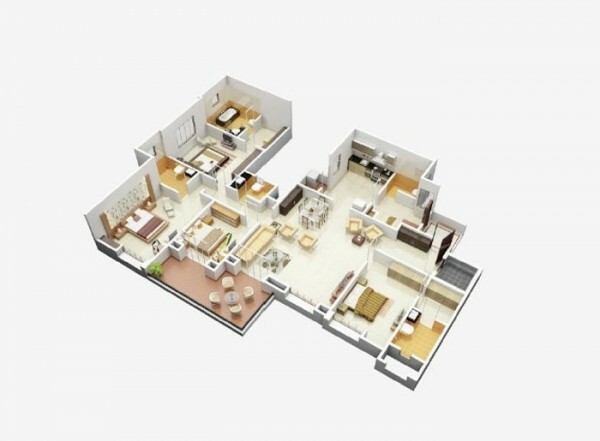 Another spacious option from DLF that includes a master bedroom, children’s bedroom and a servant’s bedroom with separate entrance. 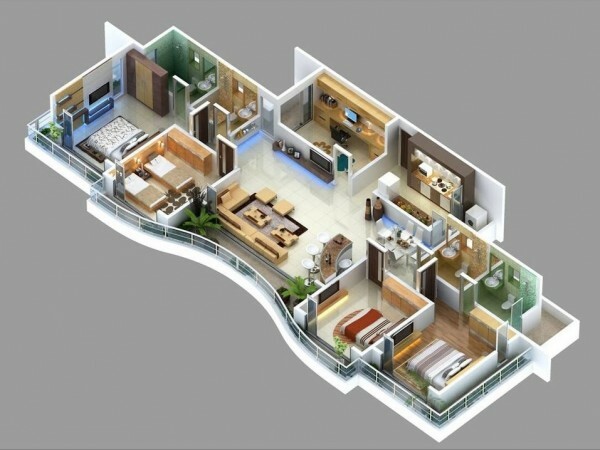 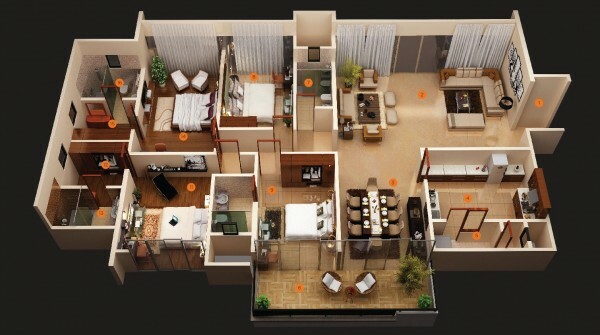 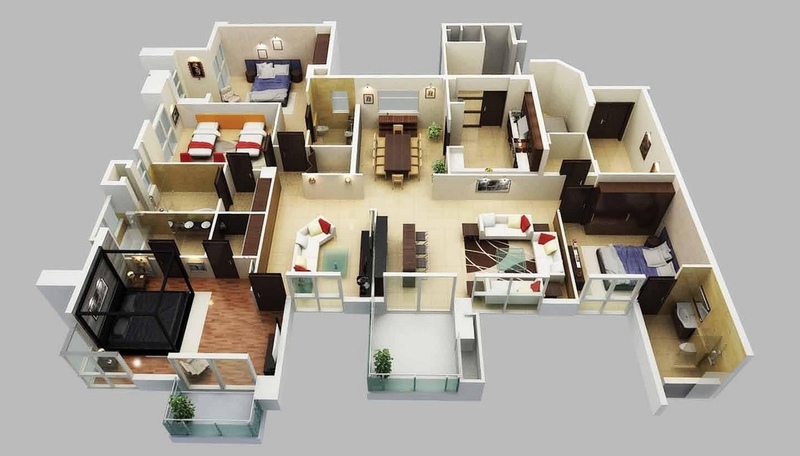 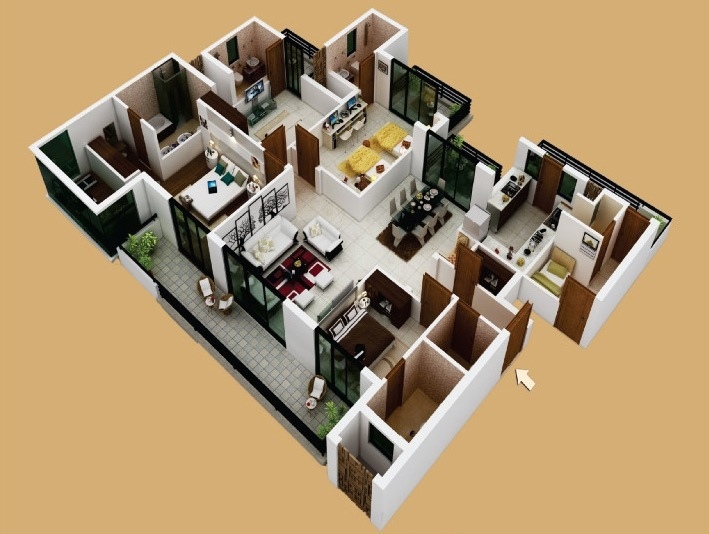 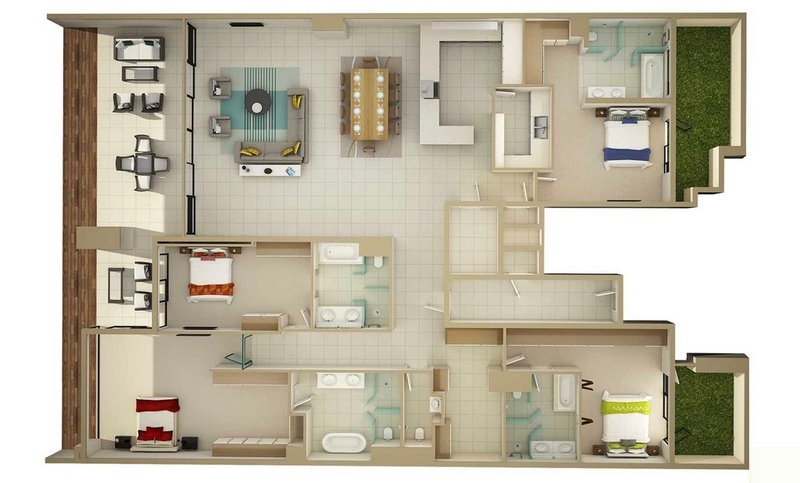 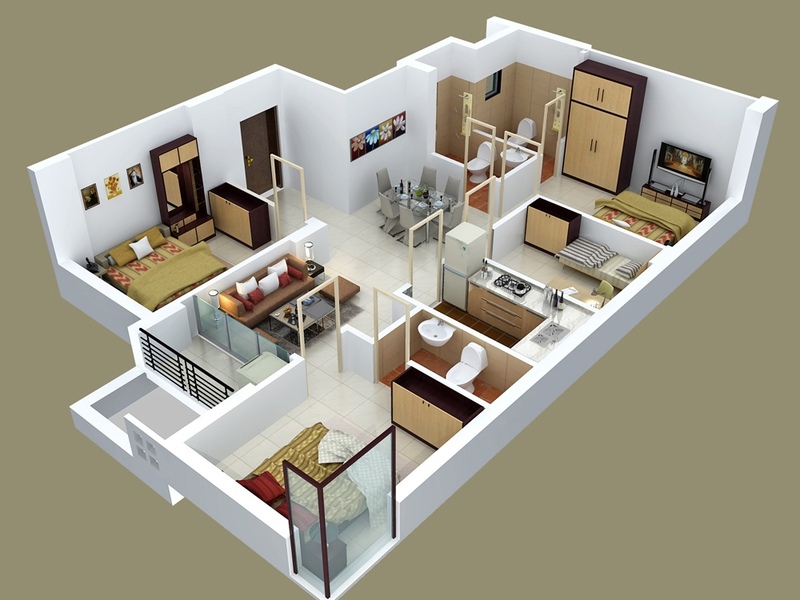 This apartment from First Site Apartments proves that you do not need a lot of space in order to have four bedrooms. 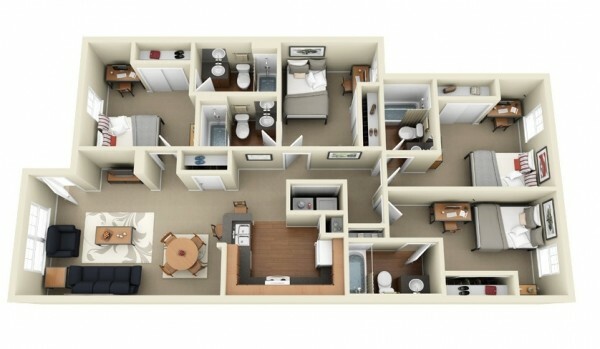 Although, you may need to downsize the beds. 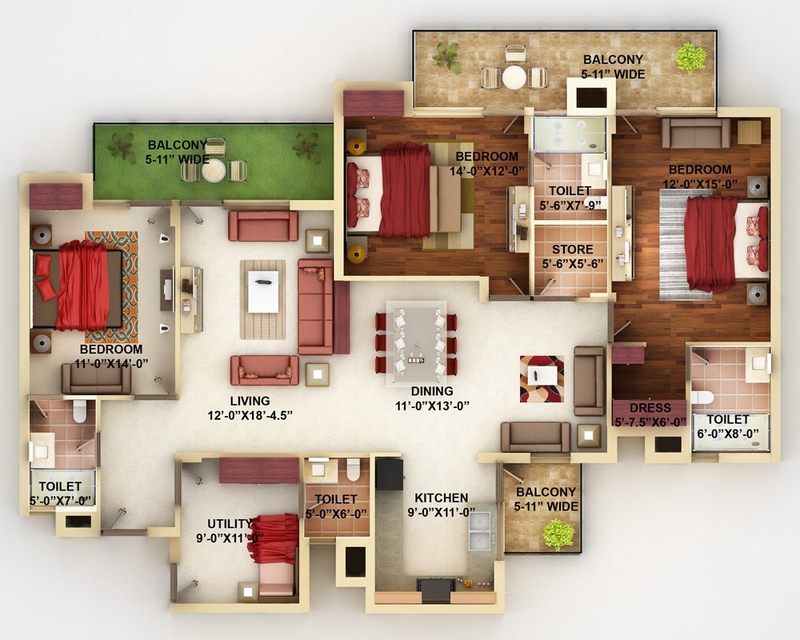 At only 1950 square feet, this four bedroom apartment can still comfortable fir a small family or a few roommates with room to spare. 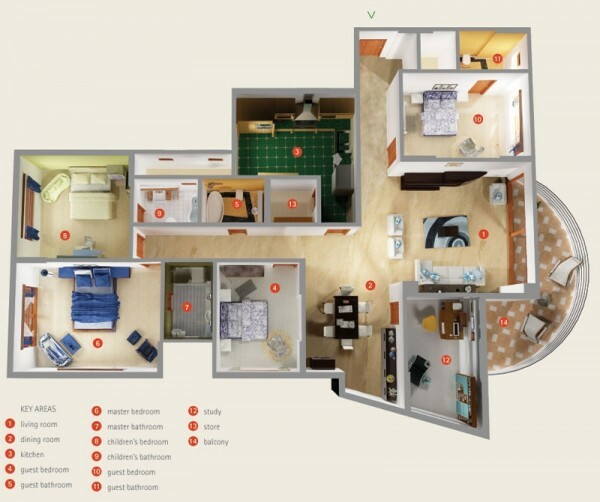 With splashes of color and plenty of opportunities to enjoy the outdoors, the VTSRealty four bedroom could be ideal for a growing family. 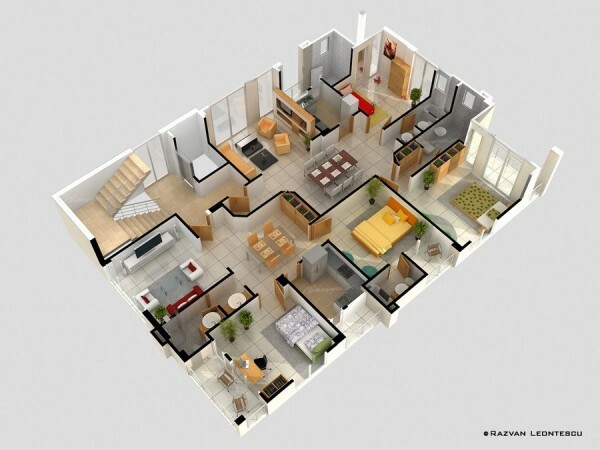 Visualizer Shake Gurgenidze does a wonderful job of making four bedroom layouts seem playful and brights.